One of my favorite cities to visit is Los Angeles as it offers an almost complete package to the tourist. This one of Dorling Kindersley's wonderful Top 10 series of books captures the best things to see and do in this huge city. Whether it's movies or cemetries, parks or hotels, beaches or museums you're interested in, there's a wealth of history (new and old) to be found in this astounding city. Naturally movies and movie stars reign supreme, so you'll do well to visit some of the studios, the Hollywood Walk of Fame, Sunset Boulevard, or take a tour of the stars' homes. If you're into culture, the Getty Center or the Los Angeles County Museum are musts. This book offers an incredible amount of things to see (you'll more than likely only be able to do a fraction) so be sure to make a list of what you'll have time to see. If you have children, they'll not be bored. Disneyland is the obvious choice, but there are others like the zoo, Universal Studios, the Natural History Museum, Storyoplis, or the Santa Monica Pier. Now, if shopping is your thing, you'll celebrate when you see all the shops along Robertson Boulevard; Melrose Avenue; Main Street, Santa Monica; Montana Avenue, and of course, Rodeo Drive. There is also the opportunity to take in a movie, a show, a concert or a comedy act. If food is your idea of fun, there are any number of famous (and not) restaurants to sample, like Spago, Joe's, Musso & Frank Grill, and Nate 'n Al to mention just a few. Don't forget to visit Downtown and Around Town — there's more to be discovered. I like the little Morning and Afternoon Day Trips offered — so helpful if you don't have much time for sightseeing. L.A. is not just "Hollywood", it's also Beverly Hills, Santa Monica, Venice Beach, Pasadena, Malibu and more. 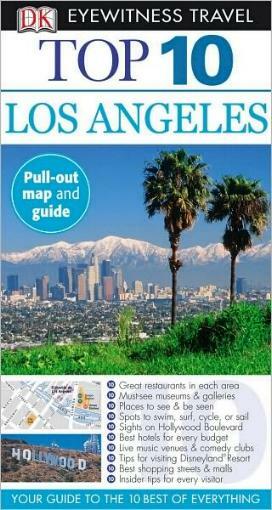 This gorgeous gem of a book is packed with great information to make your trip to L.A. so much easier, and there's a pull-out map for added convenience. Of course there is the usual need-to-know info on arriving in L.A., getting around, accommodation, general info, and more. Conclusion - Another fabulous DK travel guide, one I'm definitely taking to L.A. next time!